The main dining room became home to one of the world first “wine towers” in 1999. This iconic 50-foot wine tower houses over 20,000 bottles of wine in over 3,000 varieties, this even includes the Aureole exclusive sparkling wine, “Aureole Cuvée.” The wine list is carefully curated by the wine director, Harley Carbery, who works closely with the chef to make perfect pairings. The main attractions, of course, are the “wine angels” who gracefully ascend the tower to grab your chosen bottle in a true Vegas-style pageantry. But though you may come to see the “angels,” you’ll stay for the impressive cuisine. 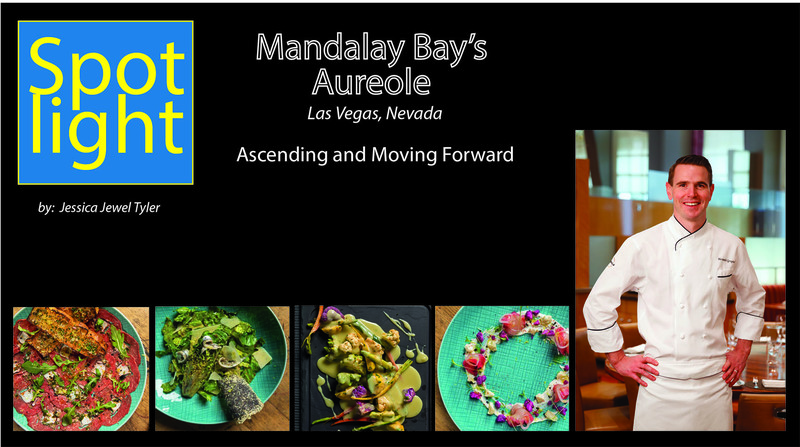 Chef Alex is the perfect fit for Aureole’s “Progressive American Cuisine” because of his love for and skill in traditional French cooking. He even trained under Chef Alain Ducasse, also known as the Godfather of French cooking, in Paris on the second floor of the Eiffel Tower. Many of Chef Alex’s recipes are very similar to the traditional ones from his formative days of training and his youth. For example, the rabbit with dried plum chutney and mustard, featured on his menu, is similar to a traditional dish he would have eaten in his childhood home. 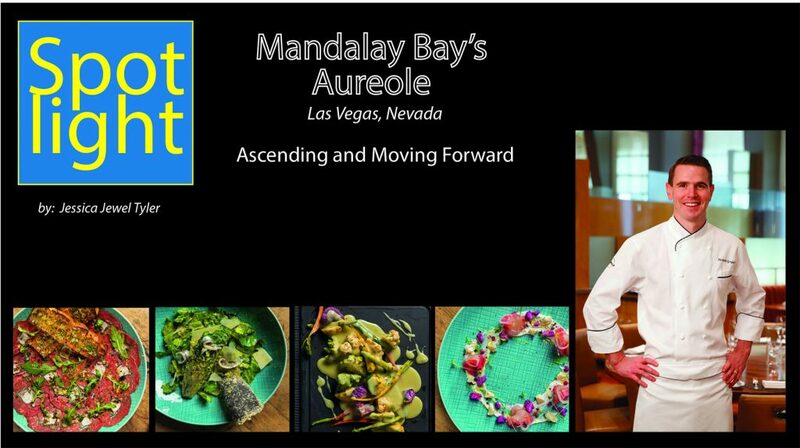 Although Aureole offers a bevy of carnivorous pleasures like beef, rabbit, and lamb, their most requested dishes feature both surf and turf. Some popular seafood additions at Aureole are the King Crabs, Lobsters, and Smoked Fish. Since Chef Alex is from near the Mediterranean Sea, he is very well versed in seafood and in fact claims it as his favorite thing to cook. He expressed excitement over the Halibut dish he perfected just in time for the West Coast season. The Halibut is presented on a savory buckwheat crepe with baby leeks sautéed in butter and mussels and clams in an au jus made from their own liquor that has been perfumed with saffron. Another Chef Alex seafood creation is a spring dish with Bristol Bay U/10 Scallops paired with English peas, pearl white onions, and bacon. He plans to change about seven other dishes for his new spring menu with a focus on “following the seasons.” Chef Alex plans to incorporate more of the incredible freshness from spring produce like asparagus, baby peas, and carrots. He’s even expanding the vegan options with an Asian inspired dish of miso, eggplant, Daikon, Lotus Root, and Shitake Mushrooms. We can’t wait to see where the season will take him next!